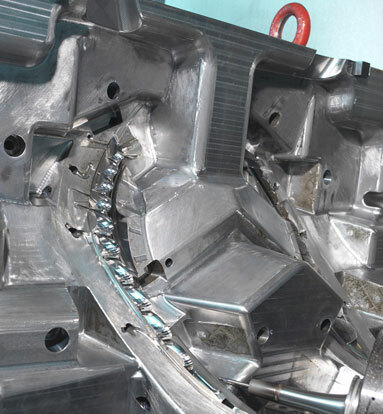 Producing medium to large molds is a specialty of Cavalier Tool & Manufacturing Ltd. This global manufacturer serves a variety of industries, including aerospace, automotive, recreational and commercial. The company excels in applications with high glass content such as lighting tools, door carrier plates and door panels, as well as fans, shrouds and radiator intakes. It works with a wide range of materials but primarily handles aluminum, P20 and H13 steel. For many years, this Windsor, Ontario, company did not have the capabilities for high-speed machining in hardened material and had outsourced much of this work. However, once the recession hit, Cavalier Tool decided to regain control of some of these capabilities by investing in new machines to handle high metal-removal rates and fine finishes in hardened materials. In selecting equipment, Cavalier Tool had several requirements. Many last-minute engineering changes can often originate from the OEM during the production process, so Cavalier Tool has to be able to set up and tear down parts as quickly as possible without disrupting overall workflow. The company also needs a level of finishing quality on its molds that would not require secondary machining operations or benching procedures. When it comes to equipment, Cavalier Tool is careful in its selection—the company looks at each new investment with a particular emphasis on the machine’s potential longevity and reliability. In 10 years it expects the machine to be as accurate as it is today. A Makino a92 horizontal machining center (HMC) was chosen to replace its existing vertical machining centers (VMCs). The company had already seen a similar Makino VMC in action in a shop where it had previously outsourced its hardened material applications. Cavalier Tool chose the a92 based on its similarity to that machine, and because of the positive experience, longevity and reliability it had with its previous Makino investment. In hard metals, the a92’s best feature has been speed. It completes jobs with triple the productivity of previous processing techniques, with spindle uptimes at 90 percent. This speed is attributed to setups having been cut in half due to features such as the automatic pallet changer and the 92-capacity automatic tool changer. Because pallet changes are completed in just 23 seconds, the company can also introduce more tools into its process. Both the pallet and tool changes occur without interrupting workflow. The rigidity of the a92 has also enabled Cavalier Tool to significantly reduce the time spent performing benchwork. The machine is highly accurate, exceeding specifications with tolerances under plus or minus 0.0001 inch. Due to this new investment, the company is now able to do more with less. It has increased production even after removing seven previous machines from its shop floor. The purchase of the a92 has also enabled it to bring the hard-metal machining business that had previously been outsourced back into its own shop. It is now completing jobs in hardened metals twice as quickly as it would on competitive machines. Today the company handles only the complex jobs and is acquiring new customers and continuing to grow.